Cebu is located in the middle of the Philippine islands. Known as a world class diving destination because of its water temperature through the year which is 27-30C, the best for tropical fishes and drop off with the coral terrace around the island that has the water depth of 30m-50m that goes up to 50m-300m depth with 45 degree sloop. 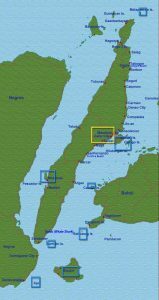 The popular diving spots destination are Hilutungan Island, the Moalboal and Pescador in the southern part of Cebu, Cabilao and Balicasag in Bohol, Apo Island in Negros and Siquijor Island. However, because of the distant of some diving spots, Mactan Island in Cebu is already enough for divers who are billeted at area resorts, they opted to dive in a neighborhood diving spots, the likes of Hilutungan Island, a marine and fish sanctuary, the Mactan Island dives is now being enjoyed by divers, the Tingo Island dive, where you can find by chance a Thresher shark. Aside from being a perfect diving spots, Mactan, Cebu is also accessible to have it on season and weather timing, among others. 1) Cebu City and Mactan Island, the center of diving industry, which serve blooming dive sites nearby Mactan, with lots of marine sanctuaries, the Hilutungan and Nalusuan Island,among others,as base also of diving trip to Bohol, Negros, Malapascua, Moalboal, with world class hotels and resorts. 2) Moalboal Dive Resorts, located in southwest of Cebu, 80kms. away and 3 hours drive from Cebu City, with beautiful dive sites, especially the Pescador Island. K I Marine Sports Center’s Dive Shop is based in the center of Mactan Resort Hotels, mainly serve the famous dive sites nearby Mactan, the Hilutungan Island and Nalusuan Is. Marine Sanctuaries and many more variety of dive sites .Please view our location and services, with Dive safaris, Discovery Diving, Diving License and more.